It’s easy to get distracted from good intentions: promises we make to ourselves and others. We are in the midst of Lent. For Christians, Lent is a season of preparation before Easter; a period of 40 days (Sundays not included in the count). Lent is a time of aligning intentions and actions. Christians use the 40 days to commit to spiritual disciplines including praying, fasting, and giving in order to reflect on Christ’s legacy. Whether you are a practicing Christian or not, perhaps think of Lent as a time of conversion and renewal. Where does your life need changing? Consider using the transition between winter and spring to lighten your spirit. Thanks to Minhthu Lynagh and Creighton University’s Lenten program http://onlineministries.creighton.edu/CollaborativeMinistry/online.html for the following ideas. Create a personal altar populated with symbols that indicate your resolve to change. Release. Spring clean for freedom: we all accumulate more than we need. Lent might be a good time to deliberately pare things and commitments and intentionally simplify our lives. This clearing away of non-essentials also places us in solidarity with those having less. Lent can be a good time to reflect on the people and relationships most dear to us. Reconcile with someone you’re estranged from. Relationship conversion through forgiveness and reconciliation can be one of the graces of Lent. How can we strengthen or heal our relationships? 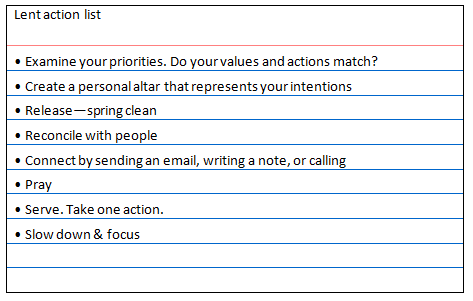 Set an intention to pray for a specific person and connect with her or him by sending an email, writing a note, or calling. Adopt one of the traditional Lenten disciplines: give, fast, pray. Slow down. Focus. Take time to be. As daylight returns, lighten up. My Lenten intentions include regular meditation, developing sacred space inside and out, and writing for the Index Card Cure ™ blog. What are yours?